WP.1) Which Level of Worksheet Program Subscription to choose, Basic or Universal? 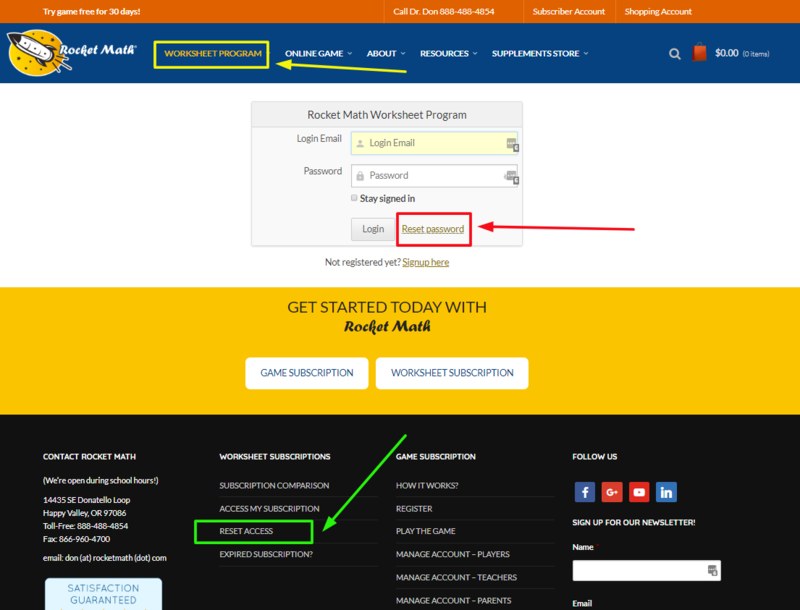 There are two levels of the Worksheet Program Subscription, Basic and Universal. With a Basic Level subscription you only have access to the blue [BASIC] drawers, you do not have access to the drawers with the red titles. 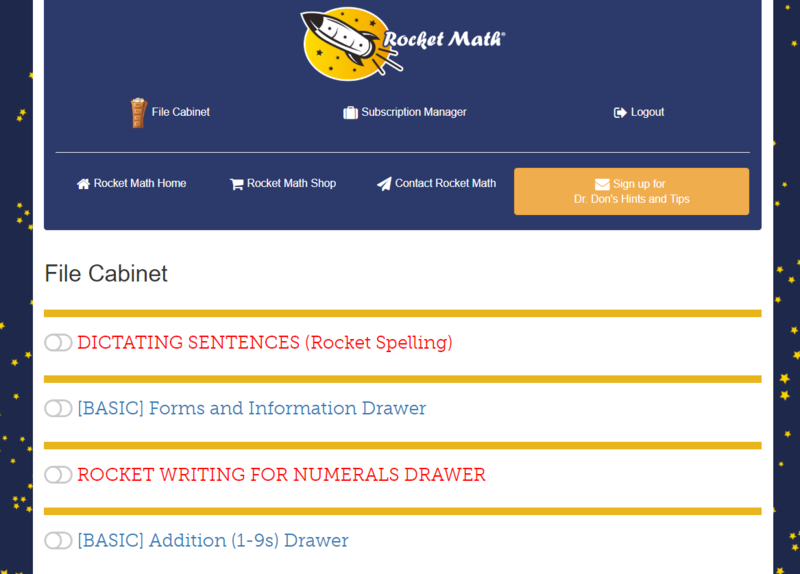 Rocket Math began its life as just the four basic operations of add, subtract, multiply and divide, with just the 1s through 9s facts. So that is the Basic Level subscription, which also includes the Forms and Information “drawer.” The Basic Level subscription contains all the worksheets you need to run the program. 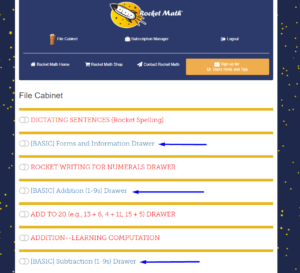 In the filing cabinet, the “drawers” with blue titles that say [BASIC] contain the worksheets for the basic operations, which you can open and print out. (See the blue arrows pointing to them in the picture?) Each operation goes A to Z, and if you never want to do anything but that, then you can choose the Basic Level. The Basic level is around 40% less expensive than the Universal level subscription. Within the Basic Level is a one-year $29 Individual subscription, a 3-teacher subscription, a 6-teacher subscription and a Whole School subscription. Go to this Subscription comparison page to make your choice. Both levels are displayed on the page. The Basic level options are shown on the right in yellow. The Universal level options show in the blue panel on the left. You can order from the Subscription Comparison Page by clicking on what you want and it will take you to the ordering page. 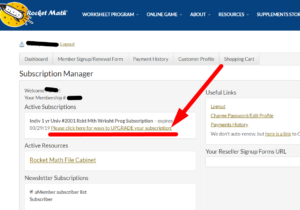 The Universal Level Subscription–lots more than the Basics! What do these programs address? Below are links to pages describing each of these programs which will open in a new tab (so you can find your way back here). 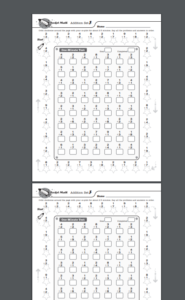 Each page tells you what the program is for, as well as showing you a picture of the worksheets that students will use. Kinder level skills. 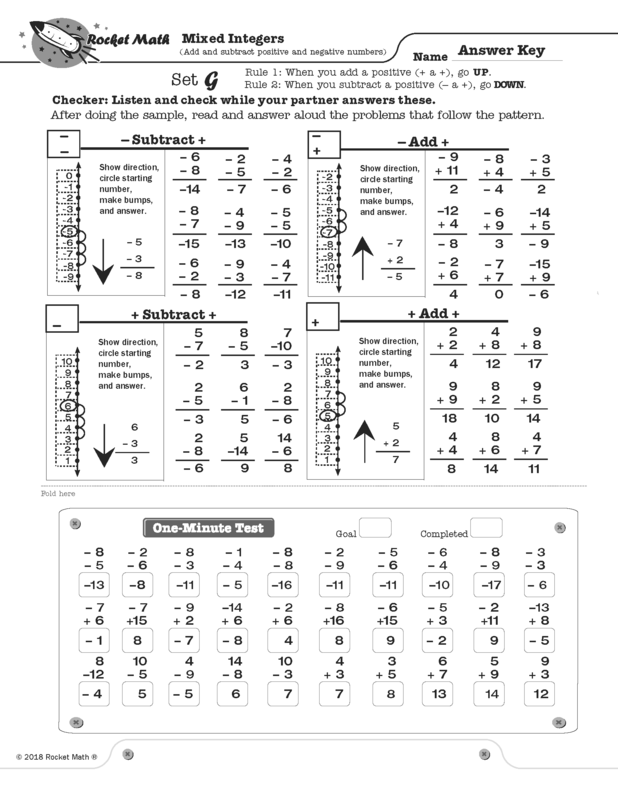 Pictured here is one worksheet (of 72 in the program) for Rocket Writing for Numerals. This is a program for helping little ones learn to write numbers, correctly, efficiently, quickly and legibly. It is great for Kindergartners or for the start of first grade. Additional numeracy skills for quick learners. At each grade level there are additional programs that students who quickly master the basics can do during Rocket Math practice time. Whether it’s Skip Counting, Fact Familes, or 10s, 11s, 12s facts these optional programs build numeracy skills for students who have learned the basics. Advanced Middle grades math. 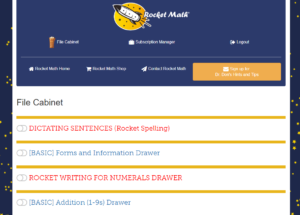 At the opposite end of the curriculum from Rocket Writing, we have a program for practicing Mixed Integers (adding and subtracting positive and negative numbers) which many middle school students find challenging. That program includes short online video lessons for each type of problem the students learn to solve. We also have equivalent fractions and factoring. If you are a math teacher of middle grades, you have some students who know their basic facts and some who do not. These Universal programs at the upper end of the curriculum are excellent for students who already know the basic facts to do, while the ones who still don’t know the multiplication facts can work on those basics. Ten minutes a day, but everybody has something at their level. Spelling too! You might notice at the bottom of the list, Dictating Sentences (Rocket Spelling). This is a spelling practice program Dr. Don put together to help improve spelling during writing activities. Many students learn to spell well enough to “pass” a spelling test, but can’t quickly and fluently spell words when they are busy writing. This program works like Rocket Math, in that there’s paired practice with a partner. Each student can be placed at the level of success and practices spelling words they know in dictated sentences ten minutes a day. If you have twenty minutes you can devote toward spelling (or time during a writing block) this will help students be able to write more easily and fluently the most common words they need for writing. Dr. Don believes in helping students develop ease and fluency with all academic skills. The Universal level is around 40% more expensive than the Basic level subscription. Within the Universal Level is a $13 60-day trial, as well as one-year subscriptions for an Individual for $49, a 3-teacher subscription, a 6-teacher subscription and a Whole School subscription. All new programs will be added to the Universal Subscription as soon as they are completed. 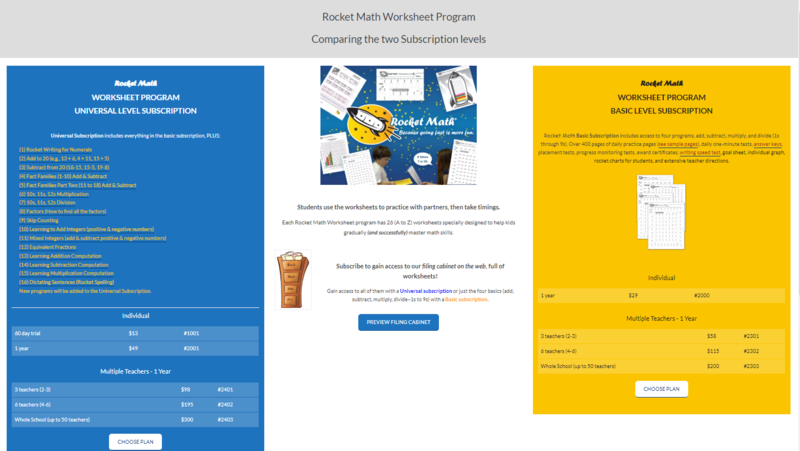 You can order the Rocket Math Worksheet Program from our Subscription Comparison Page by clicking on what you want and it will take you to the ordering page. Both levels are displayed on the page. The Basic level options are shown on the right side of the page in yellow. The Universal level options show in the blue panel on the left. 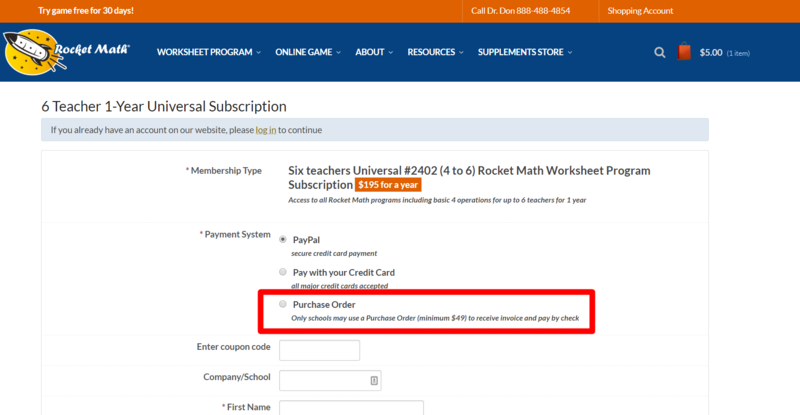 If you are unsure of this program, try the 60-day trial of the Universal Level subscription to the Rocket Math Worksheet Program for $13. Otherwise, the rest of the subscriptions are for 1 year. The only other decision is how many teachers will need access to the program. 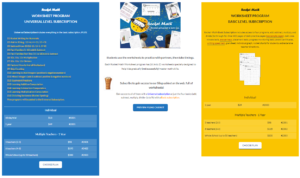 There are subscriptions for Individual teachers, for 3 teachers (plus the subscriber), for 6 teachers and for a whole school (up to 50 teachers). 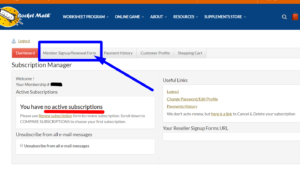 When you select the subscription plan you want on the Comparison page you’ll be taken to the Sign Up form page. It looks like this, with the plan you selected at the top. If you want to look at all of the other options again, go back up to “Worksheet Program” in the blue navigation bar at the top and choose “Sign Up.” That will take you to a Sign Up page displaying all the options from which you can choose. Next you pick one of three ways to pay. We accept PayPal and credit cards. We accept Purchase Orders only from schools, only for $49 or more, and we expect that entering the PO number means it has already been approved for payment. You then are asked for identifying information including your name and email address. That email address is the main identifier of this account and must be used to access the account in the future. You use that email address and the password you create to add teachers, renew, upgrade, etc. Don’t forget it! WP.3) How do I login to my subscription and access the filing cabinet of worksheets? WP.3) How do I login to my Worksheet Program subscription? 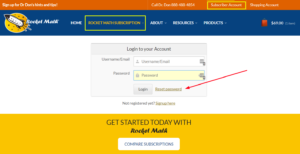 There are several places to login at the Rocket Math website. 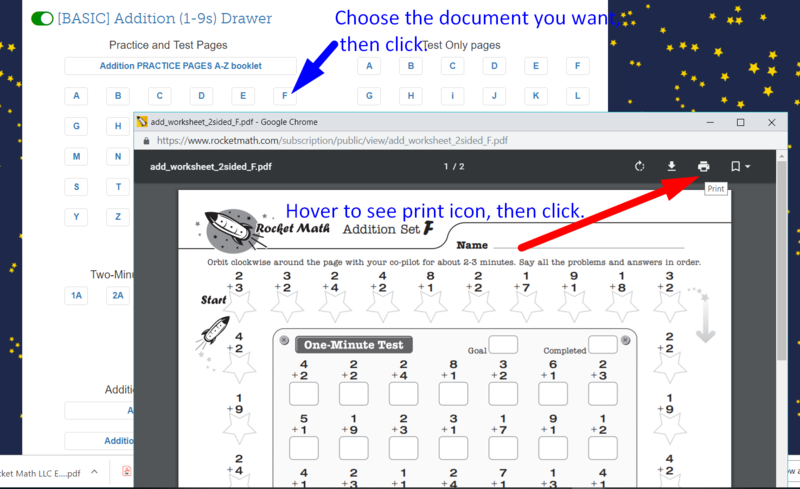 For the Worksheet Program pull down to “Login” or click on the words “Worksheet Program” on the blue navigation bar at the top of the homepage. It is outlined in yellow in this picture. You should see the dialog box for logging in centered in the page. You enter your “Login Email” in the first box and your Password in the second box. Password not working. If you do the above on this and it does not work then you entered the password incorrectly (try it again) or you aren’t remembering it correctly. Don’t ask us, because we can’t see your password. 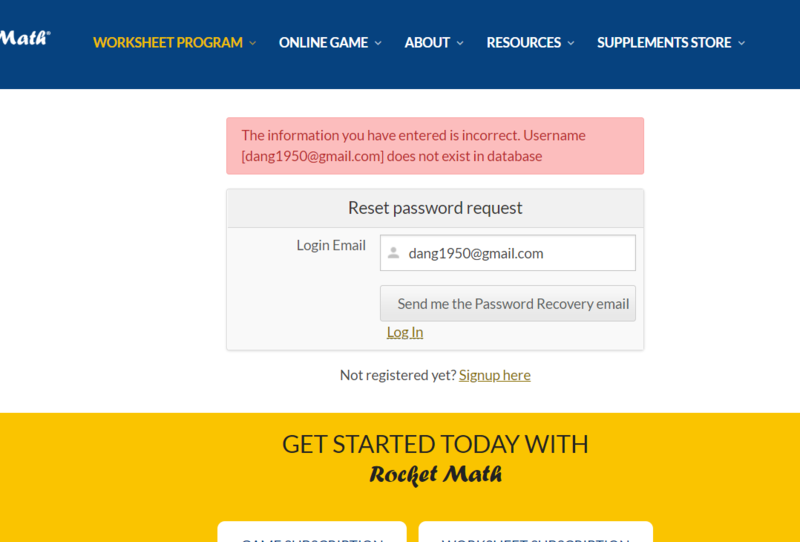 If it really isn’t working then click on the “reset Password” link. (Do you see it outlined in red?) That will give you a dialog box in which to enter your login email. If the system recognizes your email address, the system will send you a “password reset” email. 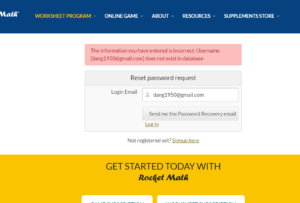 Password reset email sent to you. You have to go to your email inbox. 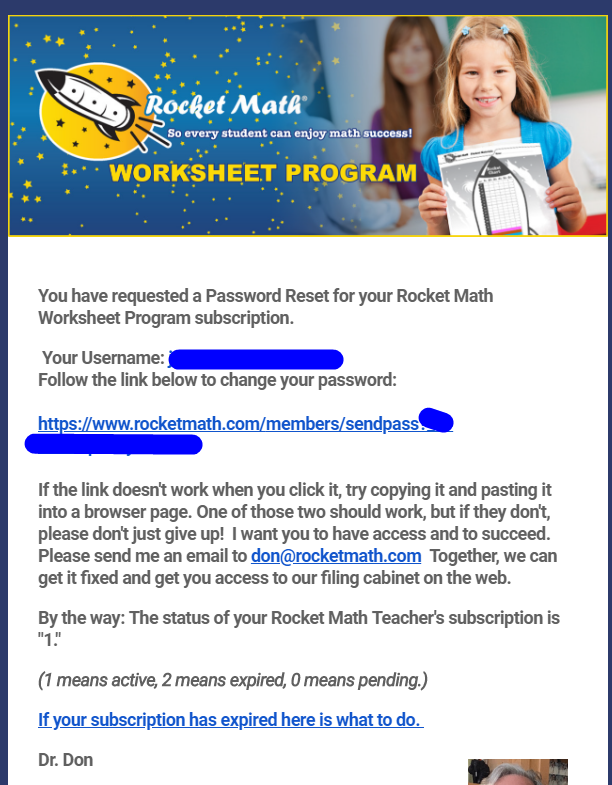 Look for an email titled, “Rocket Math Worksheet Program: Password Recovery.” Open the email. It should look like the picture on left. The email gives you a link to go to. Click on the link and it takes you to a page where you can reset your password. It’s OK to re-use the same password, or at least the one you thought it was. Then after doing that you’ll be able to get right into your account. The email gives you some other ideas if clicking on the link doesn’t work right away. It also gives you the status of your account (1 means active, 2 means expired, 0 means pending). You can still login even if you are expired, because that’s where you go to renew. Note: Sometimes customers accidentally entered their email incorrectly when they first signed up. Then when they try to get back in with the correct email, it won’t work. That’s tricky to find but we can help you with that by looking the account up using your first and last name. You can always ask us for help. Email [email protected] or [email protected] with your first and last name and school and let us know it is for the Worksheet Program. We will be able to locate your account for you. WP.4) How can I fix (renew, upgrade, change) Worksheet Program subscriptions? 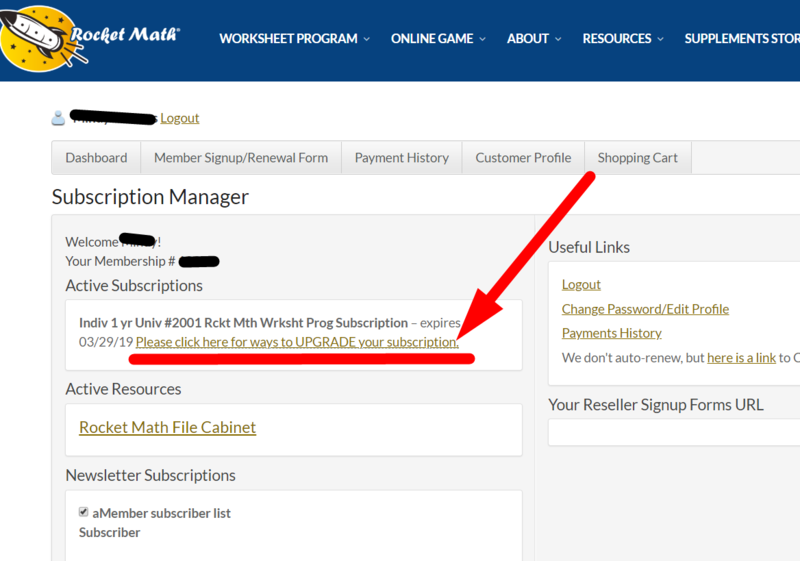 Go to the Subscription Manager page. When you login to your Worksheet Program subscription account you are taken to this File Cabinet page with the large blue section at the top. [Note: the only exception is if your account has expired, in which case you go directly to the Subscription Manager page, rather than getting into the filing cabinet.] 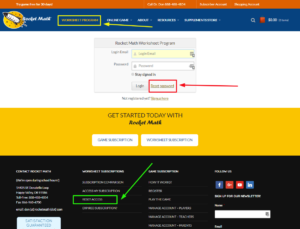 The link to the Subscription Manager page is outlined in yellow in this picture. 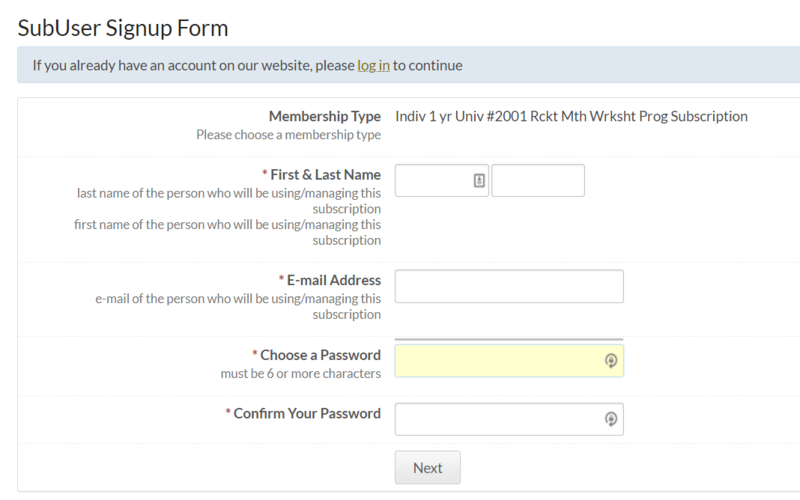 Click on the Subscription Manager link to, well, manage your subscription. The “drawers” below are the working parts of the filing cabinet. If you don’t see the “Subscription Manager” link at the top, then you are not really logged in. If the middle link on the page says, “Preview Subscription Files” then you are NOT logged in. You’re in the preview page. On the upper right of the preview page click on “Subscription Login” to login to your account. Then you will get into the File Cabinet and you can click 0n the “Subscription Manager” link. In the Subscription Manager page. Here’s what the Subscription Manager page looks like. See the red underlining? It highlights the “You have no active subscriptions” alert. If you see that, then you know you must renew your subscription in order to get access again. Click the Renewal tab to renew your subscription. See the tab outlined in blue? 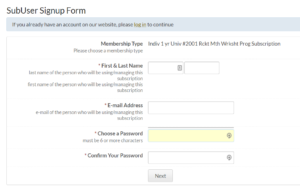 It says Member Signup/Renewal Form. Click on that to renew your subscription. It will take you to the same page as was displayed when you first signed up. If you’re not sure what to choose please see the FAQs above that help you decide which level of subscription you want or how to signup. 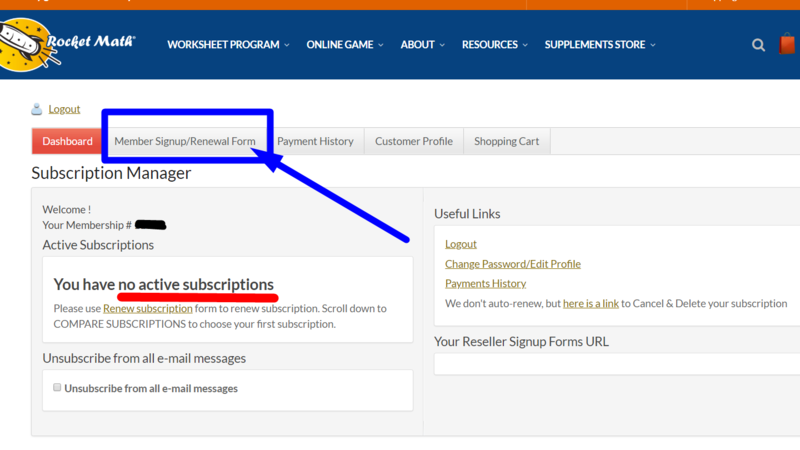 Click the Upgrade link to change or upgrade your Worksheet Program Subscription. In your Subscription Manager page (assuming you have an active subscription), there should be a link, like the one underlined in red in this picture. It says, “Please click here for ways to UPGRADE your subscription.” If you click there you will be taken to an ordering page where you can choose any of the subscription plans that are an upgrade for you. Upgrading means you can go up a level (from Basic to Universal) or add access for more teachers (from Individual to 3 teachers to 6 teachers or to Whole School). An upgrade will change your subscription as soon as you pay for it. It will start a new year-long subscription from that date forward. You will be charged the normal rate MINUS the value of the unused portion of your old subscription. An upgrade will enable the same method of payment you used previously. If you want to change payment methods you will have to contact us to enable that. Note: Using a Purchase Order to pay for an upgrade online usually does NOT work so you may have to send the PO to [email protected] and she will make it happen for you. ***In fact, if you have trouble enacting any of these changes, send [email protected] an email from your subscribed email account and she should be able to help you. Oh, be sure to give her your Membership # and tell her you’re talking about the Worksheet Program subscription rather than the Online Game subscription. WP.5) How do I print worksheets and forms from the Worksheet Program? Sign in to your account with your email and password here. You will be taken to our Filing Cabinet on the web. Looks like this. The drawers with the red titles are part of the Universal Level subscription. You can preview them with a Basic Level subscription, but you can’t print them out. Yes, there is a spelling program there that Dr. Don created. Also, Rocket Writing for Numerals and many more. 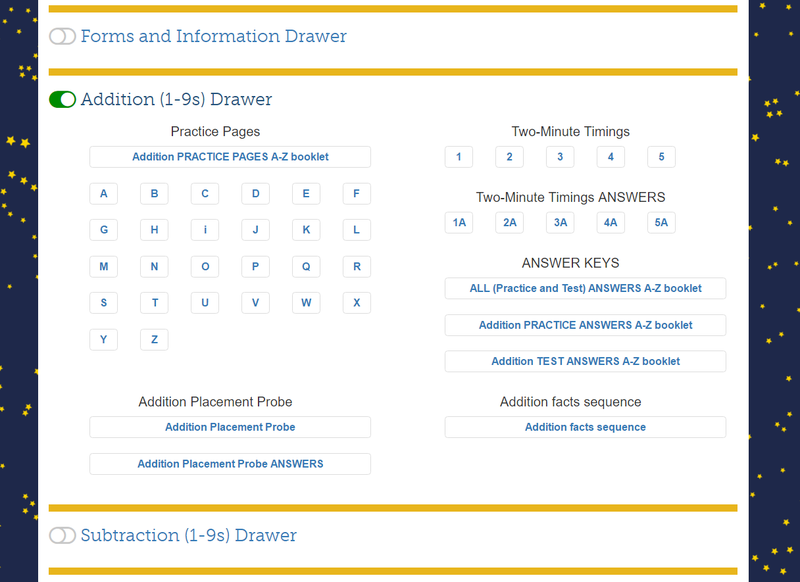 The [BASIC] drawers have the blue titles include add, subtract, multiply and divide 1s through 9s facts. These four programs are the basics that all students need. The first [BASIC] drawer is the Forms and Information Drawer. Most importantly this drawer has the four forms you have to print out for every student to get started: The Rocket Chart, the Writing Speed Test, the goal sheet and the Individual Student Graph. 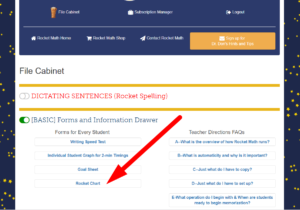 There are optional forms you may want to use including forms for keeping track of student progress other than on the Rocket Chart. It has the Teacher Directions. It includes the FAQs and the chapters of the Administrator Handbook. Open the right drawer in the filing cabinet. To choose what to print, you begin by opening a drawer you wish to print from. For example here is the Addition (1s-9s) drawer. You can see the practice pages that the students use. There is a booklet of all the pages A-Z. There are also individual pages. There are the Two-Minute timings you use for progress monitoring. There are the answer keys, which are only in booklet form because that is the best way to print them out (on colored paper) and give them to students. There are Placement Probes if you have upper grade students who may know some of the facts already. There’s also a document showing the sequence in which the facts are learned, letter-by-letter. 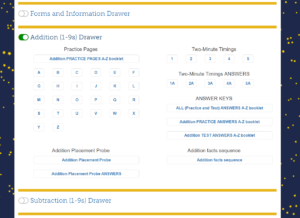 In the pictured example, the user clicked on “F” in the Practice pages. As you see in the picture, the document will pop-up, pretty much full size. You will have to hover in the upper right corner to see the print icon. See the red arrow pointing to the printing icon. When you see it, then click it to get it set for printing. 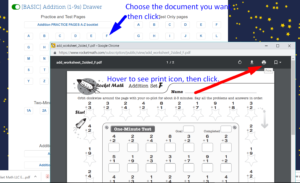 Two-up printing is enabled for all the basic student practice pages. 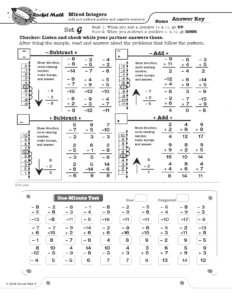 Customers have asked for the ability to print these worksheets two-sided. So you’ll see that the practice pages are set up like the picture to the right. If you choose two-sided for printing you’ll get the same worksheet on both sides. Set it to print 60 copies two-sided and you’ll get 30 sheets of paper with the worksheet on both sides. Print to your school’s copy machine. Note: You can print worksheets from your phone! If you bookmark the filing cabinet on your phone and connect your phone to your school’s copy machine, you can print from your phone. It is far better than having to stand at the machine and copy from a hard copy. 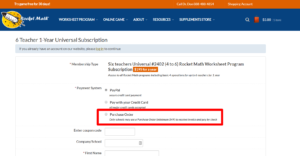 WP.6) How do I sign up other teachers for our school’s Worksheet Program subscription? You are now subscribed to a multi-teacher account and you are the Subscription Manager. That makes you responsible for seeing that your teachers get signed up for their subscriptions so they can access the Rocket Math filing cabinet. I know it’s a big ask, but we think you’re up to it. When you’re ready to start, login to your account and go to the Subscription Manager page. Your account page looks like the picture here. 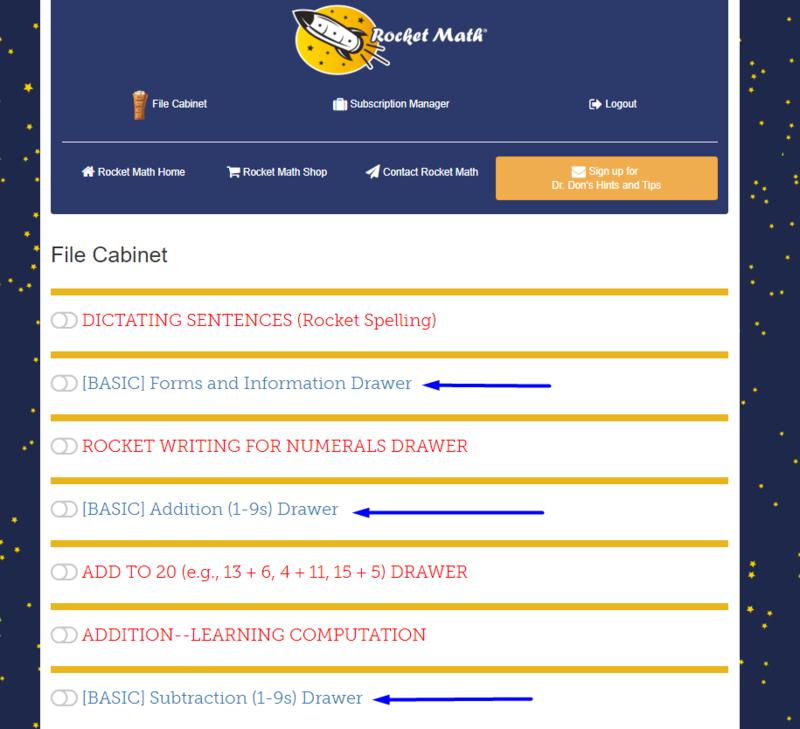 There are two options for how to get everyone else access to the Rocket Math filing cabinet. Either will work. Option #1 You send your colleagues an email, so they can sign themselves up. 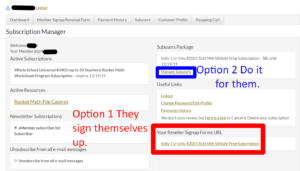 You can go the area, outlined in red above, where it says “Your Reseller Signup Forms URL.” There is a link under that title in brown font and underlined. 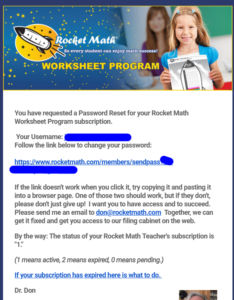 Paste the link into an email message and send it to all the teachers who should have access to Rocket Math. 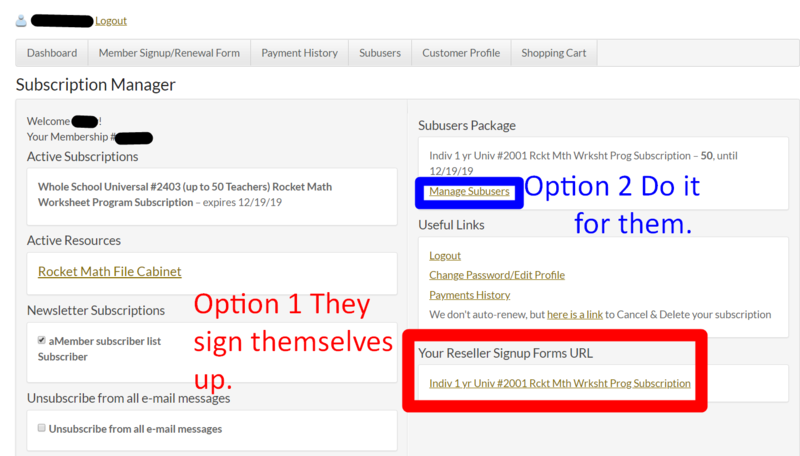 When they click on the link it will take them to the SubUser Signup Form pictured to the right. Then they can fill it out, make up their own passwords, and each will then sign themselves up. 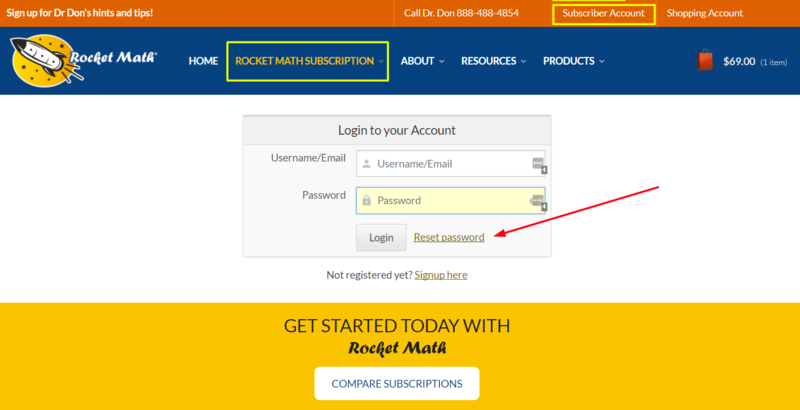 ***If you need a more thorough explanation, click this link to see our tutorial video “RocketMath.com: How to sign up your colleagues.” You’ll understand exactly how to do it. Option #2: You fill in the information for your teachers (AKA Subusers). On your account page you can to click on the “Manage Subusers” link which we outlined in blue in the picture above. 2A. Click on “New Record” to add teachers individually. Once on the Manage Subusers page, you go to the link outline in red to the right labeled “New Record“ [instead of add teacher, go figure!] to add teachers one at a time. You enter their first and last name, their email address and set up a password for them. Save it and then click on New Record to add the next one. 2B. Click on “Import from CSV” to add teachers in a batch. You can import the teachers all at once by creating a csv file and importing it. You can also find it on our “Add Subusers” page here or under the Resources tab. 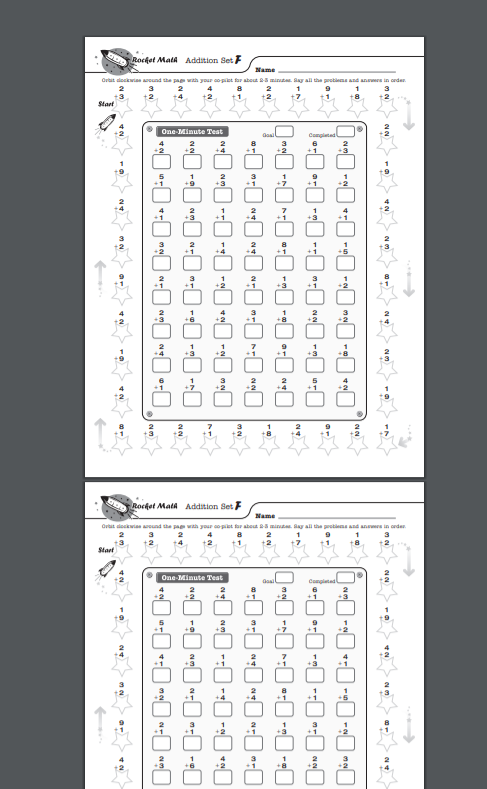 That page also has another copy of this template for the csv file you will need if you want to import a bunch of teachers all at once.